I appear to live in an ageist culture that believes that getting older necessarily implies worse health. The younger you are, the less people believe what you say or feel. I became disabled by a chronic health condition when I was 19 and it has been a consistent uphill struggle to get the full extent of the severity of my health condition recognised. The disbelief factor was definitely experienced with my GP. He decided that I should keep my muscles mobile so refused to recommend an electronic wheelchair. My main condition is fatigue and I didn’t have the energy to use a manual wheelchair or a walking stick. Essentially, my GP only wanted me to be independently mobile to the end of my driveway. I needed someone with me from that point to pick me up off the floor when my muscles wouldn’t keep me upright. My GP also prescribed swimming to help with my muscle mobility. He said three times a week for 20 minutes a time. That was textbook guidelines with no consideration for my disability. With fatigue, you start the day with a limited amount of energy and have to budget how you spend it. It gets spent travelling to the leisure centre, getting changed, the 20 minutes in the water, getting changed and getting home. That was my day spent, beyond eating and toileting. I managed to maintain that twice a week. My nearest leisure centre had two hour-long disabled swimming sessions, when you didn’t have to deal with lanes cordoning off the pool or the waves non-disabled people make when they agitate the water. It also had gendered changing rooms. There were two disabled change areas – one within the ladies changing and one on the poolside for male and unisex. My carer was male, so we had to use the unisex/male. But so did all the other men with disabilities. Understandably, it was a long queue as disabilities often slow things down. I was the only woman to use the disabled session. The staff asked me to have a female carer so I could use the ladies changing room. They expected me to conform to an idea of gender binary. I explained to them that I put my disability care only in the hands of those I know and trust and leisure staff or agency staff didn’t come under that. In the end, I had to prove my disability was more severe than everyone else – with Disability Living Allowance decisions – in order to use the changing room last to get in the water and then first to get out. There was a row of people sitting in towels getting cold waiting for the disabled session to start, sometimes for over an hour. Thankfully, another leisure centre opened nearby that had entirely unisex changing with cubicles of various sizes and adaptations. If you wanted total isolation, there were separate bricked areas for your security. But some features still remained. Second, there was just one solitary winch to hoist people in and out of the water if you couldn’t cope with the staircase – needless to say, it was in high demand for the disabled sessions. Third, there was the shower that didn’t stay on and gave no indication as to the temperature. When you don’t have the energy to keep pushing the button, and either get red skin or seized muscles from inappropriate shower temperature, an experience ‘prescribed’ by your GP can do more harm than good. This is also true of the pool temperature. I’ve sat in Blackpool sea and it’s easier on the body! Then, the public transport provider decided to stop buses going to the leisure centres from the largest bus station in the area. As I’m unable to drive a car due to health and poverty, I can’t get there unless my neighbours are free to take me and bring me back. Annoyingly for me, this situation could have been avoided if my Primary Care Trust funded the medication that the NHS knows to be of significant benefit to people with my fatigue disorder. I live in the wrong area to get the medicine I need so I can do these things more independently. It could also have been avoided if hydrotherapy was available for more than 13 sessions a year and the waiting lists were short enough to let that happen every year. Then there’s the mobility scooter – a symbol of independent mobility – which I haven’t been given access to. I rely on the sporadic kindness of strangers. I’m being denied vital health and independence opportunities. Now we’re in a recession, it’s getting worse. 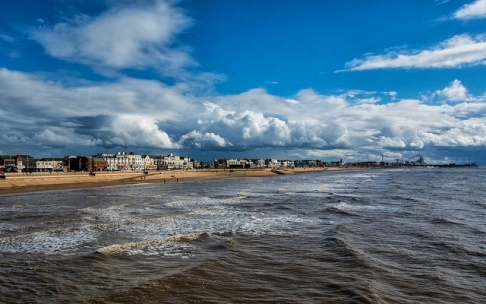 Image is of Blackpool sea – there are a few low waves, the shore and some buildings can be seen in the distance, the sky is partly cloudy with blue patches. It was uploaded by Flickr user Szczepan Janus and has been shared under the Creative Commons Licence.